As I write this, finals are right around the corner for most students… and here right now for others. So today, we’re going to talk about how to create an effective study/revision schedule for finals. What I want to do specifically with this video/article is show you one of my own study schedules from my freshman year, which will hopefully give you a good idea of how to structure yours. However, before we get into my particular schedule, I first want to go over some general tips that should help you craft more useful study schedules overall. By using these principles when creating your schedule, you’ll give yourself the best chance of meeting all your challenges while mitigating your knowledge gaps, time constraints, and other limitations. With that said, let’s go through all the essential steps. Luckily, most of my professors were pretty good about letting everyone know that information – but I still made sure to double-check the website. Showing up to an empty classroom an hour after the final happened is the easiest way to fail said final, and I didn’t want it to happen to me. What material will be covered – specific chapters/sections, or comprehensive? Also be aware of any projects and assignments you might need to finish. You can challenge yourself to complete them well in advance of your finals; that way you’ll free up the week or so leading up to your exams for concentrated studying. Buuuuuuut who am I kidding… we all have projects we have to finish during finals. I’ve already talked about how to finish homework when you’re in a time crunch, but here’s one other thing to consider: What’s the best way to intersperse homework and studying? Some people might like to mix study and homework sessions into one day in order to give their brain a change of pace after a while. If you’re like me, though, you might do better by concentrating all your project work into as few days as possible, separating it all from your studying. Lastly, using your materials, go through and assess your knowledge for each class. Look carefully for any gaps in your knowledge that will be covered on your exams – these areas are where you’ll want to pay special attention when studying. Now that you’ve gathered your material and done a review of what will be covered, it’s time to prioritize your exams so you’ll know how much to study each subject, and what order to study them in. However you prioritize each class, compare those decisions with the gaps in your knowledge you identified earlier when deciding which classes to focus the most heavily on. In the book How to Study in College, author Walter Pauk advises to create a “Home-Stretch Schedule” when you’re nearing finals. This is essentially an uber-detailed version of your normal schedule; you should include things like little tasks, meals, and other small events. The point of creating a schedule with this amount of detail is to identify gaps in which you can schedule your study sessions. If I may add one suggestion to Pauk’s method, I think you should try to shuffle your small tasks around so they fall into concentrated batches – thereby freeing up bigger blocks of uninterrupted time, which are needed for intellectual combat. I only had six classes that semester (and two only met once a week), but since I worked more than 20 hours a week as well, my time management had to be on point. Finally, I had an accurate picture of my week; at this point, I was able to identify the gaps in my schedule and create study sessions for each class. Lastly, here’s a quick look at my schedule during the actual finals week. Note that I didn’t schedule study sessions during this week – probably because I was lazy at the time. You still can. Remember that your mind’s efficiency is dependent upon your body’s performance. Make sure to schedule time to get some exercise, and also take breaks and have some high-density fun. Doing so will keep your stress levels down and give you a clear head. Ask for help early. If you’re stuck on something, going to office hours can really accelerate the review process. When you do, though, remember the Corson Technique. 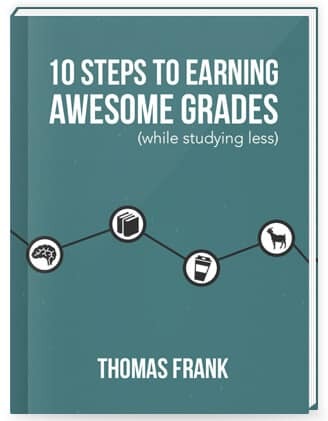 If you want even more techniques that can help you study better and earn better test grades, you’ll enjoy my free 100+ page book called 10 Steps to Earning Awesome Grades (While Studying Less). Hopefully these scheduling tips were helpful to you in some way! If you have additional advice that I didn’t mention, definitely share it down in the comments so it can help other students.